Let me put it to you, dear readers, that we have been on a yaatraa together, you and I. Through what country? To what destination? 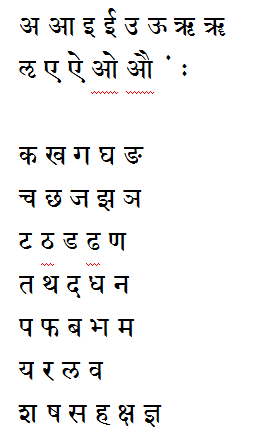 Why through a few words of the Sanskrit language and the meanings which can be brought out from them. Through the territory known as Advaita Vedanta. Departing from the akshara Akara and landing here at the penultimate post, the last 'sleep' before reaching the goal of this particular sojourn. Today, fellow travellers, we reach the letter 'Y' according to the English alphabet. The akshara Yakara. The Sanskrit alphabet, known as Devanagari, is longer (even longer if all archaic forms are used) than the English, so there was no danger of running short of a route to traverse. It has been a typographical yaatraa. Devanagari also runs in a different sound order, but it matters not to take a more circuitous route, enjoying the scenery along the way. When we pause here for breath and look back, does not the picture start to form, the landscape and its undulations make sense? Those of a tamasika nature would look at the 'way' and perhaps make a few steps, but they will readily find distractions, furnish excuses for not continuing. Let them be. They need the dark nooks and crannies for now. Those of rajasika quality will be determined to travel, but it will not be done comfortably or without complaint. Some straights will be fine, along with the occasional downhill and slow corner… but oh those hills. So many hills to climb within ourselves. There may be argy-bargy, questions tossed, even some barbs thrown. "Why are we doing this again?" Brows knitted, shoulders knotted, muscles tensed and heads throbbing. Mostly though, they will stick through, just in case there's something in it for them. The sattvikas are gently finding their footing. They are pulled along by the allure and promise of something truly worth the finding. Our own True Self. They will have been seeing land which looked and felt familiar yet was presented in a different light. The realisation of the common threads, complimenting or even obliterating the differences. "What's this?" you are asking, "Yamini-amma's rocker is fully off the porch now!" No, dear ones, a yaatraa is not only for the legs and lungs. One might say it is not even for… rather, it is for the mind, intellect and the essential "I". Walking established routes to places designated sacred is an excellent exercise; but they are designed to make us overcome the body and, ultimately, that monkey mind, the judgmental intellect and the ailing spirit. They do help us to focus on our saadhana - our daily devotional practice and contemplation. For those with good fitness, there could be some attempt at yaatraa in its common application. For the Christians, there is the Camino de Santiago. Though the Eastern Orthodox church has other choices. Other Christian places to go… and there is also the Mormon Trail. For the Jews, there are the Pilgrimage Festivals. Muslims can take the Hajj to Mecca. Zoroastrians have the Yazd and Six Pirs. The Baha"i have a list too. 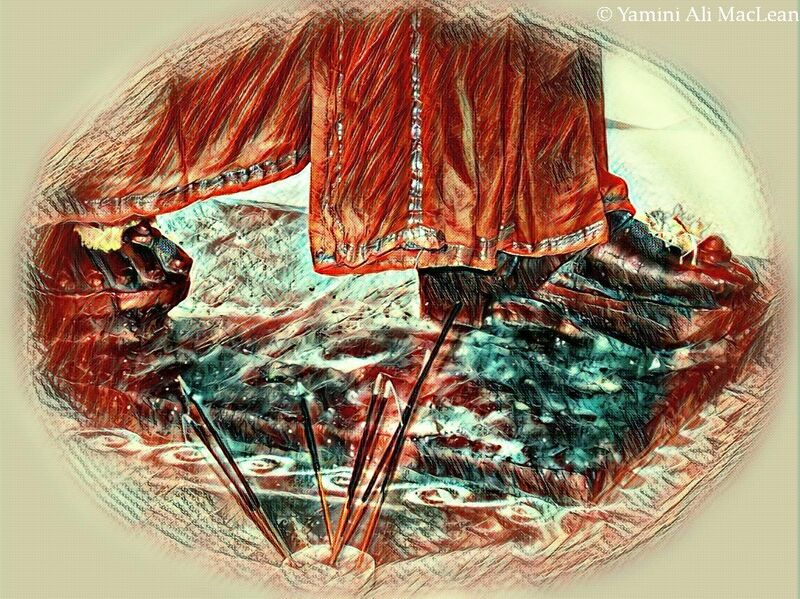 Buddhists may choose The Astamahapratiharya. Sikhs will always include a visit to the Darbar Sahib among other sites. In Australia, the Aboriginal families 'walk the songlines'. For Hindus, yaatraa can be walking to the nearest mandir (temple). There are lots designated as especially sacred. However many folk make plans for the Himalayan yaatraa called the 'Char Dham' - the four holiest abodes. Take it from one who has walked many lands, to walk in the Himalaya is to know something other than land, or sky or ocean or air… There are countless places on this Blessed and Beautiful globe which can embrace you, hold you still and return you refreshed and ready for more life. There is only one place where it is possible to touch Heaven as it reaches down and touches you. That doesn't mean one cannot have a full and meaningful journey sitting in one's own living room! Again, take it from one who has experienced, it is entirely possible to travel on your own floor. All that is required is an empty mind, a full heart and quashed ego. Total surrender and supplication. Make a yaatraa into the core of you. You may be surprised what you discover. I like the idea of contemplative walking - totally immersed in your surroundings and freeing one's mind of distractions. Thank you for such an enlightening and thought-provoking post. i had a long comment ready about how much i hate travel and even trips to the stores for necessary items. then i got to the part about MIND travel and that i love. blogging for me is mind traveling even though i understand that is not the kind you are talking about. i travel to other countries. about the contemplative walking in my mind, i have been guilty of to much of that at times and not enough at others. Thank you so much Yamini for allowing us to walk with you in this enlightening yatra. These thought-provoking, serene, and inspiring posts on Advaita Vedanta have made such a huge impact on my mind. I really want to learn more about Advaita Vedanta. I am a fan of all yatras - feet, eyes, mind, heart...Himalayas are truly special, for the faithful and the clueless both. As one who loves to walk I can see the appeal to that type of journey. Even without a religious belief system I am attracted to the idea. A journey through my living room? Hmm, not something that would have occurred to me. Would you count my journeys through the other worlds of books? Insightful post and love the creative photo! I have quite enjoyed this yaatraa Yamini - it has been beautiful, edifying, challenging, clarifying and expansive. Thank you for your guidance, your wisdom, and the peeks into your beautiful heart. This is interesting! For the non-affiliated, there is forest bathing, which is what I do! Once you dive into such, one realizes that there are many commonalities to organized religions: e.g., Do unto others, common to all religions in various forms.